EVANSVILLE, IN – Bear Archery announced today the launch of an all-new crossbow to the 2019 Bear X lineup. 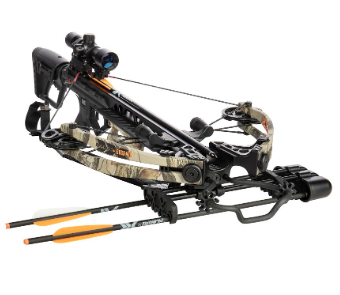 The Saga 405 is a high-performance crossbow built for top-of-the-line speed, extreme accuracy, and maximum versatility at a price that is attractive to well-seasoned hunters and novices alike. The fully stocked Saga 405 comes complete with all accessories needed, including a 4x32 scope with multi cross-hair reticle, four-bolt quiver, cocking rope, three carbon bolts with field points, and rail lube/string wax. At Bear Archery, we believe in disrupting the price-to-performance ratio and making archery accessible to everyone. Our all new line of Bear X crossbows is Bear’s latest example of package crossbows that deliver performance and value. Engineered for top-of-the-line speed, extreme accuracy, and dependability, these incredible weapons are perfect for any new to experienced hunter looking to spend more time in the woods. Bear X is a division of Escalade Sports. For more information on Bear X, its products, brands, instruction manuals, retailers, warranty, replacement parts, or customer service, please call 1-800-694-9494 or visit www.beararchery.com. Headquartered in Evansville, IN, Escalade Sports is a global manufacturer and distributor of sports and outdoor recreational equipment. Leaders in their respective categories, Escalade Sports’ brands include Bear® Archery and Trophy Ridge® archery accessories; STIGA® and Ping-Pong® table tennis, Accudart® and Unicorn® darting, Onix® pickleball equipment; Triumph SportsTM indoor and outdoor games, GoalrillaTM and Goalsetter® residential in-ground basketball systems, Goaliath® and Silverback® residential in-ground and portable basketball goals; the STEP® fitness products, LifelineTM personal fitness, Woodplay® premium playsets, VulyTM Trampolines, and Cue & Case® specialty billiard accessories. Escalade Sports’ products are available at sporting goods dealers and independent retailers nationwide. For more information on Escalade Sports, its brands, instruction manuals, retailers, warranty, replacement parts or customer service, please call 1-888-784-4288 or visit www.escaladesports.com.